So here's another great sign from www.engrish.com. 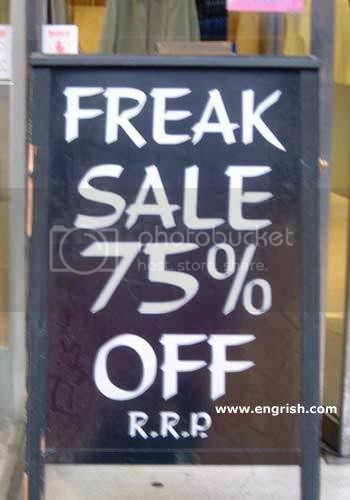 Apparently all the freaks in Japan are 75% off now, which I think is a great bargain. Matter of fact now that it's February, the month of Love... or month of "Lub" as my husband calls it, it's time to reminisce about those terms of affection we call our significant other. If you settle for the mainstream you're probably use to hearing the basic sentiments, like honey, darling, and dear. Then there's the super sweet terms that are mostly reserved for the newlywed set, like sweetie, honey lamb, sugar pie, sweet cakes. If you're marriage is on the rocks you might go with the more gruff "hey you", or "yo jerk" or "hey loser". Or if you're marriage has lasted over 50 years you probably just resort to a series of grunts. Now hubby and I have two sets of terms of endearment. One is cutesy cutesy and the other is of our own making. OK, so the cutesy one goes like this. I call him honey bunny and he calls me sweetie peetie. (I know, gag). The other sentiment we use is short, practical, and to the point... sort of like a verbal shorthand. I call him freak and he calls me leech. To the outside listener this might sound a bit harsh, but freak has become a term of affection in our house. If you are deemed a "freak" consider yourself in fine company. Our definition of freak is someone who is an original, an evil genius, someone who does something so off the wall, you're impressed. Then there's "leech". Normally a blood sucking worm-like creature but in the hands of a loving relationship it becomes a term that means loyal, steadfast, and "I can't live without you". It makes me wonder what other couples are calling each other? Feel free to add your own endearments in the comment boxes. I can't wait to hear everyone's nicknames for each other. So enjoy this season of "Lub" (that's lub and not lube), oh wait, maybe it's both...? and, oh yeah... you're a freak!